Ageing, becoming a senior citizen or being addressed as elderly is a normal process and spoken about with compassion. We talk about what happens to other people but are at a complete loss when it affects our own family. Hearing loss is the not the end of the world or a pitiful situation. Around the sixties all bodily functions slow down. The sight and hearing are the first to be affected. What we do not realise is that Hearing loss has a more psychological impact than the actual medical condition. Different people react differently to their hearing impairment. Some feel a lot of embarrassment and a sense of shame. Some even feel guilty of being a burden on their family. Some get angry asking “why me” especially when they come across communication problems at work which affects their careers. This in turn leads to extreme sadness and depression. Severe depression can have suicidal tendencies too. Everyone would have heard expressions like “hain?”, “say that again”, “I beg your pardon” “What?” These are the common hearing loss expressions and exclamations. These and simple gestures like cupping the ears to hear better, louder volumes on TV or radios, asking for repeat of conversations, misunderstanding few words, conversations that sound garbled, not being able to hear in crowds mean hearing impairment or loss. When people withdraw into themselves when in the company of others and do not take part in conversations, do not participate in family activities means that there is some issue which and they are embarrassed to talk about their disability and the fact that they have “aged”. They hide the hearing impairment because wearing a hearing aid is termed as ‘old’. Domestic problems also arise when the spouse or other family members get impatient and irritable because you cannot hear or understand them leading to low self esteem, low confidence and depression. Hearing problem is an easily solvable issue. The earliest sign of impairment should be shared with the family. 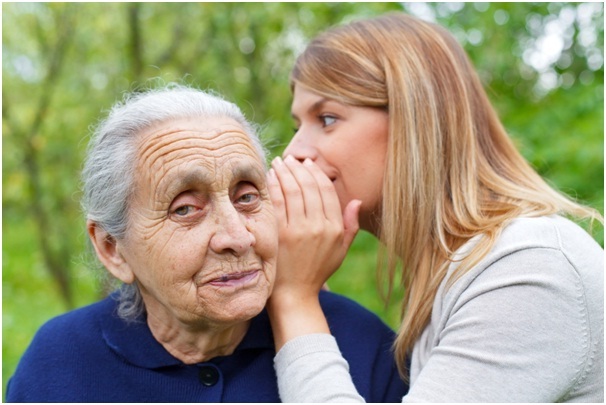 The family will then understand your issues and deal with them, and consult the nearest Hearing Solution Centre, have the impaired person assessed and equipped with a hearing aid if required. But most important than anything is that the family must have a positive, considerate and caring attitude towards the hearing impaired. It is true in every sense that elders are a big asset to a family. A healthy family is a happy family.